The new 792D is a feature packed, versatile overlocker that can use a 3 or 4 thread stitches include :4 thread overlock, wide 3 thread, rolled hem and more. The 792D is equipt with adjustable stitch length and cutting width, electronic foot control and a carry handle. 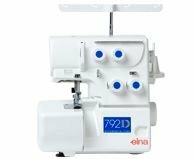 This Elna 792d overlocker is ideal for the beginning sewist., You can now make professional looking garments. The Elna 792d gives you a wide range of features in one compact machine with easy dial adjustments. Now Projects will be completed quickly and effortlessly. The Elna 792d is just so easy to use. Yes it does the roll hem plus it flat locks. Max Speed 1300 Stitches per minute.